Women's Grandmaster Camilla Baginskaite won the second international tournament she played in, the super-competitive world Girls U20 championship in 1987. At the time, she was playing for the Baltic state, Lithuania. 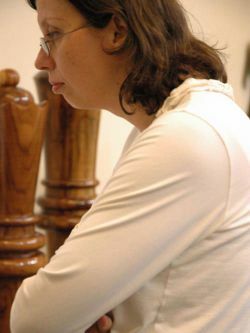 In 1996, Camilla played first board for Lithuania at the Yerevan Olympiad. There Camila met the American GM Alex Yermolinsky. Olympiads are not only intensely competitive battles for medals; they are also grand social occasions, the chess world version of speed dating. Just a year after meeting in Yerevan, Camilla married Alex and moved to the United States. In 2000 Camilla shared the U.S. Women's championship title with M.I.T student Elina Groberman. Camilla went on to defeat Elina 2-0 in a match for the gold championship ring. This victory qualified Camilla for the 2001 Women's World Championship in Moscow. In Moscow, Camilla went further than any U.S. woman in a knockout world championship. She defeated two higher rated WGMs, making it to the sweet sixteen. Then she was paired against the Chinese star, Xu Yuhua, the 2006 World Women's Champion. They each won with Black in the regular games, but Xu broke through in the playoff round. Camilla is a strong positional player with a solid opening repretoire. She plays 1.d4 with White, Nimzos and the Najdorf as Black. Camilla inspires other women by teaching a weekly female-only class at the legendary Mechanics Institute. Tall and graceful, Camilla speaks sparsely and quietly but her carefully chosen words are passionate and eloquent. She studied art and design in both her home country and the Bay Area. She also loves to read and pick mushrooms and berries, typical Lithuanian pastimes. She lives in San Francisco with Alex Yermolinsky and their two sons.